In the previous article hopefully, I prompted an appreciation for sand, particularly the silica sand used for hydraulic fracturing of most wells drilled in the U.S. shale basins. As you’ll recall, the naturally occurring sand used for stimulating well production is traditionally mined in the Midwest and transported to where it’s needed throughout the U.S., often at great expense. To minimize costs and transportation logistics, producers are increasingly turning to locally-mined sands despite the inferiority of the traditional silica sands. But, there’s also another alternative to midwestern and local sands. There are manufactured sands and other types of engineered proppants whose properties are designed to meet the specific needs of various drilling environments and conditions. Let’s look at these so-called New Age proppants and see what cutting-edge capabilities these “super sands” offer. Could a replacement for traditional frac sands be on the horizon? Read on. To better understand the rationale for manufactured proppants, a quick review of the hydraulic fracturing process will be helpful. Recall that oil and gas trapped within rock formations do not flow freely into a well once its drilled. Here’s a video that does a nice job of showing the fracing procedure. The portion of the well in the resource-bearing zone is sealed off, and fluid under high pressure is pumped into the zone. The fluid generally consists of water treated with chemicals and thickeners such as guar gum to create a viscous gel. This gel facilitates the water’s ability to carry grains of frac sand (or other proppant material) in suspension downhole. Large pumps at the surface increase the fluid pressure in the sealed portion of the well until it is high enough to exceed the breaking point of the surrounding rocks. Upon reaching their breaking point, the rocks fracture suddenly, and the fluid rushes into the fractures, inflating them and extending them deeper into the rock. Proppants are carried deep into the fractures by this sudden rush of water. Incidentally, many of today’s STACK/SCOOP/Merge wells, several thousand tons of proppant can be required to stimulate a single well. Man-made proppants have been developed mainly to address these issues, and, in some cases, to further stimulate production in ways that traditional sand cannot. Silica sand is the preferred proppant for stimulating well production, but it hasn’t always been this way. The process of stimulating wells has continually evolved as have the materials and technologies employed to do so. A variety of materials have been used for fracing in the past like walnut shells, glass, kaolin, molten zirconia, steel shot, aluminosilicates, plastic pellets, and ash. But, it was eventually discovered that these materials were no match for the inherent strength, durability, and relatively low cost of silica sands. Experimentation and new fracing techniques have driven innovation in proppant materials and today; there are a host of manmade or engineered proppants providing unique capabilities that natural proppants alone cannot. 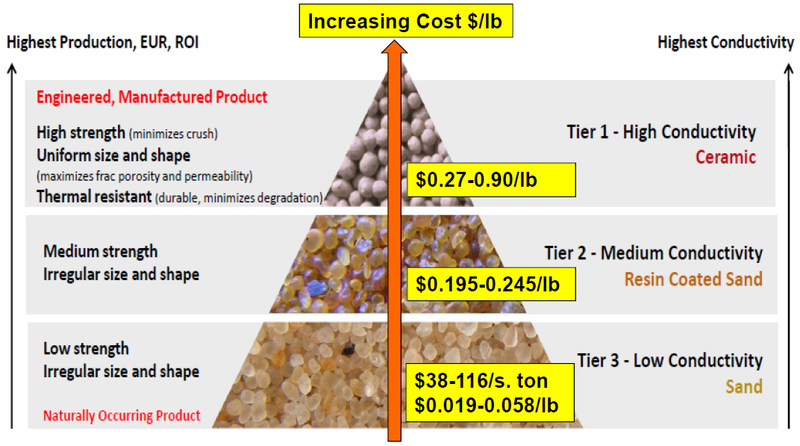 These “new-age” proppants, often in combination with traditional proppants, allow resource developers to more closely match up with conditions and characteristics of their target rock formations. By adjusting proppant properties such as size, geometry, and weight, the ideal channel for production flows can be created. Conductivity—the amount of flow that the proppant will allow. Acid Solubility—tests of solubility in acid can indicate contaminants and determine how the proppant is likely to perform underground. Shape – the degree to which a proppant grain is round or spherical determines how it will react to fracing fluids and produced oil or gas. Crush resistance – a proppant grain’s ability to withstand the stress of high bottom-hole pressures found in most of the U.S. shale plays. Solubility – the inability for the proppant to dissolve within a substance. Turbidity – the absence of impurities such as clay, silt, etc. within the proppant material. Why do these properties matter? As it turns out, the physical demands placed on proppant are substantial. Aside from transportation and repetitive mechanical handling, proppant is exposed to acids and various other chemicals and chemical reactions (like scale deposition) through the fracing process. There’s also exposure to a multitude of variable and dynamic physical stresses within the rock fractures where proppants are forced. That brings us to the attraction of manmade proppants. Scientists and manufacturers have developed proppants that can be engineered to mitigate or withstand many of the physical and environmental conditions existing in deep in fractured zones. This ability to adapt proppants to precise subsurface environments is heady stuff, and it’s turning producer’s heads. Synthetic (manufactured) – sintered and fused synthetic ceramic materials or metals such as aluminum. Let’s take a closer look at Resin-coated sands (RCS’s) first. RCS’s have been a mainstay of stimulation treatments for more than 40 years. The longevity of RCS’s is primarily due to its ability to form a pack within fractures thus preventing proppants from flowing back into the wellbore during fracing and production. It’s also stronger than sand and often the choice when compressive strength is needed to prevent crushing in areas of extreme pressure at depth. There are two types of RCS’s: Curable and Pre-cured. Curable resin chemically reacts to other resin particles and fracturing fluids. This capability allows the resin to bind with other chemicals and particles to prevent fluids from flowing back into the well bore where it can harm production equipment. It’s not surprising then that curable resin is the most commonly used RCS. Pre-cured resin, however, has a different benefit that often makes it the right choice for well stimulation. As the name implies, pre-cured resin is already fully cured when introduced into the fracturing zone. Thus it is highly resistant to crushing and interaction with other particles and chemicals within the fracture. Most RCS’s in use today are coated with phenolic resin, but recently developed polyurethane coated sands are also gaining acceptance in the marketplace. Sands coated with polyurethane demonstrate exceptional crush strength, comparable conductivity, and superior flowback prevention when compared with traditional phenolic resin. The polyurethane coating is also considered to be more environmentally friendly than the phenolic resins which can often leach harsh chemicals over time. Here’s how RCS’s are made. A proppant manufacturer coats a proppant, mostly raw sand with a specific resin type for varying performance enhancements: preventing proppant flowback, increasing propped fracture conductivity, increasing particle crush strength, and preventing embedment. However, it’s important to note that these properties can change due to pH conditions (alkaline-acidic), downhole temperature and pressure. The manufacturer’s objective is to achieve minimum chemical interaction between the resin of the proppant with the frac fluids and additives. Ideally, continuous testing of resin-coated proppants in the presence of frac fluids and additives will prevent unwanted reactions that cause fluctuation in viscosity or spike the consumption of the breaker-oxidizer by the resin, which may lead to premature proppant consolidation or a screen out. Fracturing fluid and resin-coated proppant can complement one another for an optimized well completion if there is good chemical compatibility between the frac fluids and the resin coated proppant. In the worst cases, pore spaces can become clogged and fracture conductivity reduced, resulting in decreased hydrocarbon production and heightened risk of formation damage. Ceramic proppants are another type of manmade proppant often chosen for its superior strength under the high pressures found in deeper formations. Most ceramic proppants are manufactured from powdered bauxite or kaolin clay which is fused into tiny beads and baked at very high temperatures. Beads made of bauxite are the most widely used ceramic type. These beads are highly crush-resistant making them suitable for use as a proppant, in deeper well zones. High-density, sintered ceramic beads can withstand higher pressures than either sand or RCS’s, although it comes with some trade-offs. For one, the cost of ceramics is rather high compared with other proppants and the cost of deploying them can also be more expensive. However, a major benefit of these manufactured proppants is the wide selection of grain sizes and specific gravities compared to a natural frac sand. Ceramics can now be ideally matched to the viscosity of the hydraulic fracturing fluid and to the size of fractures that are expected to develop in the rock. Also, ceramic proppants are more uniform in size and roundness while being more homogenous in composition providing higher conductivity. Nanosensors – reusable single-walled carbon nanotubes that can study rock properties, chemical composition, and reservoir conditions downhole. Nanosensors with contrast properties (think medical scans done with contrast fluid to highlight specific areas) can be tracked throughout the subsurface during or after fracing signaling its success or if refracing is needed. Nanorobots can also be used for reservoir mapping. Coatings and membranes – Coatings and films based on nanotechnologies can protect probes, drilling equipment, tanks, and pipelines from corrosion. Other “nanocoatings” are used to transport heat along pipelines, equipment, or even to heat oil in a reservoir to increase or ease its flow. Technological development also continues occurring in the resin-coated proppant front too. Curable resins have been developed that can bond together under certain types of stress or temperature. Since the proppant is curable, it only bonds when it encounters specific circumstances, so it activates within the fracture rather than in the wellbore or lateral. Glycol-coated sands mitigate environmental and health risks associated with silica dust from traditional frac sand. Although we’ve discretely looked at proppants, it’s important to keep in mind, that the choice of proppant isn’t always limited to a single material or substance. More often, particularly in the early stages of drilling and producing pilot wells in new formations, the choice and amounts of proppants are refined like perfecting a recipe. Producers experiment with various combinations and amounts of proppants as well as chemical substances until they achieve acceptable flows of hydrocarbons from the well at a satisfactory cost. After all, the end game for operators is to maximize the stimulated reservoir volume and keep induced fractures propped open, so hydrocarbons keep flowing. If you think about it, when producers select and buy proppants, they’re investing in the sustainable space between the proppant grains. Not enough space between proppants (low conductivity) in the fracture translates to a constriction of hydrocarbon flows and lower production. Can man-made proppants replace natural frac sand? Despite the technological advances being made with engineered proppants and resin-coated sands, nearly 95% of the proppant used today in the U.S. is traditional, raw frac sand. According to the Freedonia Group, an international business research firm, manufactured sands and proppants are primarily used to supplement frac sand in deep wells where high pressures and temperatures predominate. As demand for proppants continues growing over the next several years, perhaps these advanced materials will continue modestly growing their market share as innovation in the space also continues. The bottom line…don’t look for natural sands to be replaced anytime soon.